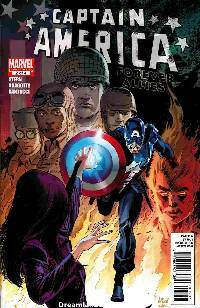 With the world at war, Bucky Barnes and the original Young Allies find themselves amid the surreal settings of a Hollywood back lot, under attack from the mind-bending power of Lady Lotus. Decades later, Bucky has become Captain America -- and now must return to the site of the Allies' greatest defeat, to stop Lotus before she can reclaim the power to control all humankind! Roger Stern (CAPTAIN AMERICA #600), Nick Dragotta (THE MANY LOVES OF THE AMAZING SPIDER-MAN) and Marco Santucci (X-FACTOR) unite to tell an era-spanning epic that they call "Havoc in Hollywood!"